ST. GEORGE — A rainstorm moving over Southern Utah Friday evening is producing flash flood conditions in some areas. Bookmark this page for continuous updates about flash flood potential in Southern Utah Friday evening. Update 9:45 p.m. Flooding has led to temporary road closures in Washington City. Update 9:30 p.m. Flooding has been reported in the Hurricane Valley area. Update 7:45 p.m. 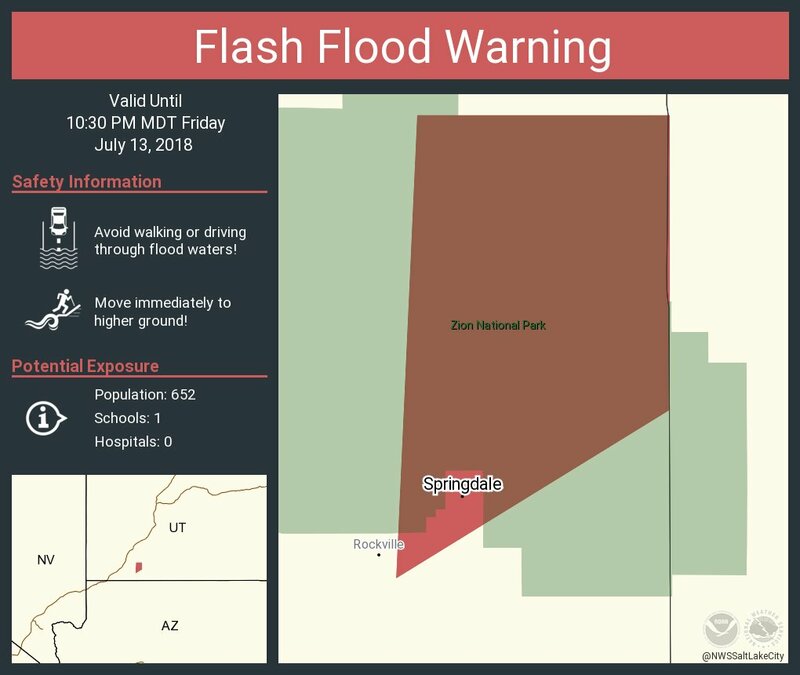 The National Weather Service has issued a flash flood warning for the eastern portion of Zion National Park. Update 7:40 p.m. State Route 143 has reopened in Iron County, according to the Utah Department of Transportation. Water in the street has led to the closure of potions of Main Street in Washington City. Flooding is reportedly occurring in parts of LaVerkin and Hurricane, including the Dixie Springs area along Sand Hollow Road. Personnel from Hurricane Valley Fire District have been paged to their stations in anticipation of flooding. 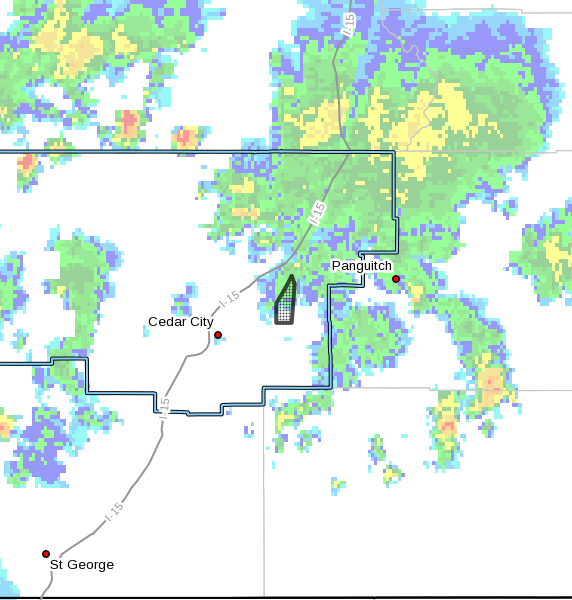 A flash flood warning for is in effect for east-central Washington County until 10:30 p.m.
At 7:32 p.m. Friday, Doppler radar indicated a thunderstorm producing heavy rain over the eastern portion of Zion Nation Park. Flash flooding is expected to begin shortly along the north fork of the Virgin River, according to the National Weather Service. Zion National Park, Springdale and Rockville are expected to experience flooding. With nearly an inch of rain having fallen in a period of 30 minutes, flash flooding is occurring on the Brian Head Fire burn scar in southeastern Iron County, according to the National Weather Service. The towns of Parowan and Brian Head are expected to be impacted by the flooding. Drainage from the storm on state Route 143 has produced debris across the road about 1 mile south of Parowan. Both directions of SR-143 are closed from milepost 4 to milepost 18, according to the Utah Department of Transportation. Motorists are advised to use an alternate route as the road is expected to take two hours to clear. Flooding is anticipated to continue for the next 3 hours through the area with a flash flood warning in effect until 8:30 p.m.
A flash flood warning is in effect for central Kane County until 10:45 p.m.
At 5:38 p.m., Doppler radar indicated a thunderstorm producing heavy rain over Last Chance, Warm Creek and Croton canyons near the town of Big Water. These drainages are susceptible to flash flooding and terminate into Lake Powell. 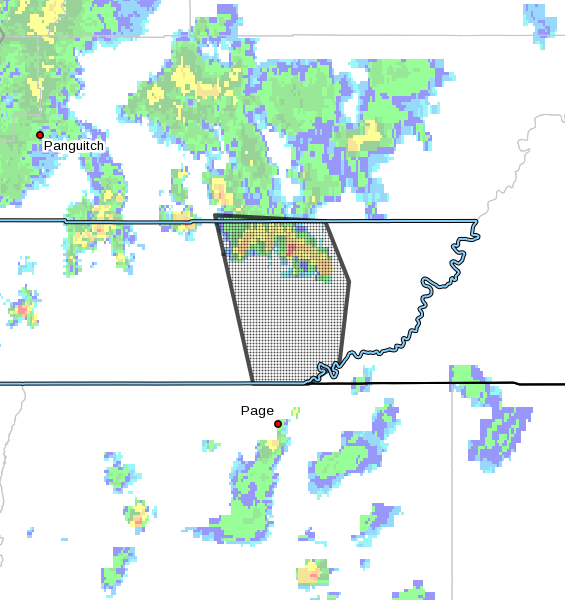 The National Weather Service’s radar rainfall estimates indicate that the headwater areas have received 1.5 inches of rainfall in about an hour. Storms are forming downstream, increasing the flash flood threat. Remain alert for flooding even in locations not receiving rain. Dry washes, streams and rivers can become raging killer currents in a matter of minutes, even from distant rainfall. Avoid already flooded and high-velocity flow areas. Do not try to cross a flowing stream on foot where water is above your knees. Thanks Bob. At least you don’t have to worry about burning those darn weeds. More coming tonite. Hold on to your hats!